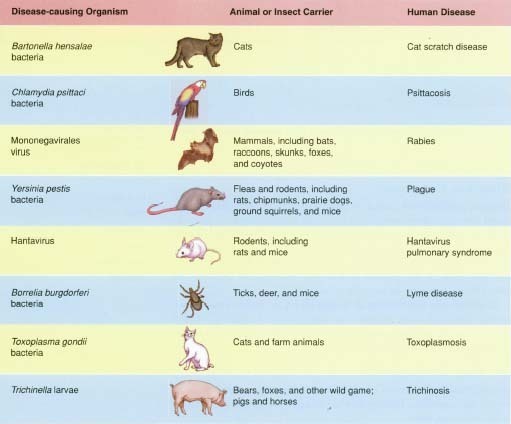 Zoonoses - body, contagious, causes, What Are Zoonoses? Zoonoses (zoh-ah-NO-seez) are infections that humans contract from animals. Zoonoses are infections caused by parasites, bacteria, or viruses that are passed from animals to humans. Most people contract zoonotic (zoh-uh-NAH-tik) infections from animals with which they have a lot of contact, such as pets or farm animals. Wild animals and insects can be the source of disease, too, particularly for diseases spread by the bite of a tick, mosquito, or fly. Animals such as wild rodents and bats also can carry diseases that may be harmful to humans. Zoonoses can cause minor or serious illness. In some cases, the organisms involved infect people, but they do not become ill. Other zoonoses can be very dangerous to people, especially anyone with an immune system weakened by age or illness. A cat carrying Bartonella henselae (bar-tuh-NEH-luh HEN-suh-lay), the bacterium responsible for cat scratch disease, usually does not have symptoms, but if the bacteria are passed to a human through a scratch or bite, a person may experience skin sores, swollen and sore lymph nodes * , extreme tiredness, headaches, and fever. Antibiotics may be prescribed to treat the infection. People who have contact with birds may be at risk for psittacosis (sih-tuh-KO-sis), also known as parrot fever. If a person inhales bird feces or urine particles while cleaning a bird's cage, he or she may develop symptoms of pneumonia (nu-MO-nyah, inflammation of the lung), such as fever, coughing, or chest pain. Antibiotics are used to treat psittacosis. A virus that is carried in the saliva of infected animals can cause rabies when transmitted through a bite or, less commonly, through contact with saliva. Symptoms include fever, difficulty swallowing, delirium * , seizures * , and coma * . Death can result if the infection is not treated. Treatment includes intensive care in a hospital. A series of vaccinations * started at the time of a bite from a possibly infected animal can prevent the person from developing the disease. Many mammals, especially raccoons, bats, and dogs, may be infected with rabies, but human rabies is rare in the United States. According to the U.S. Centers for Disease Control and Prevention, there were no cases of rabies in humans in the United States in 2000. In many other countries, especially those in the developing world, rabies is much more common. Plague (PLAYG) is a bacterial infection caused by Yersinia pestis (yer-SIN-e-uh PES-tis). Plague can be transmitted to humans through the bite of a flea that has become infected through contact with an infected rodent, such as a rat. The disease causes such symptoms as fever and swollen lymph nodes. In some cases the infection spreads through the blood and can infect the lungs. If this happens, plague can spread from person to person through coughing or sneezing. Plague was the cause of huge epidemics * in Europe and Asia during the Middle Ages, and it is still seen in many developing countries. It is seen in many developed countries too, including the United States, although not as many cases occur. The disease can be fatal if it is not treated with antibiotics. Rodents, such as mice and rats, may carry hantavirus (HAN-tuh-vy-rus). This virus can spread to humans when they inhale particles from rodent feces, saliva, or urine. People infected with hantavirus can develop hantavirus pulmonary (PUL-mo-nar-ee) syndrome (HPS), which causes such symptoms as fever, headaches, muscle aches, nausea (NAW-zee-uh), vomiting, diarrhea (dye-uh-REE-uh), abdominal * pain, and chills. In severe cases a person may experience shortness of breath and the lungs may fill with fluid. There is no cure for hantavirus infection, but people who have HPS typically are hospitalized in an intensive care unit, where they receive oxygen and other types of supportive care. Borrelia burgdorferi (buh-REEL-e-uh burg-DOR-fe-ree) bacteria inside an infected tick can cause Lyme (LIME) disease in humans after a tick attaches to the skin and feeds on a person's blood. Ticks pick up the bacterium by feeding on the blood of infected deer and mice, which serve as reservoirs for the organism. Lyme disease can produce a number of symptoms, such as extreme tiredness, muscle aches, and swollen, painful joints. At the site of the tick bite, some people develop a bull's-eye rash, a red rash surrounded by rings that resembles a bull's-eye target. A person with Lyme disease usually is treated with antibiotics. * epidemics (eh-pih-DEH-miks) are outbreaks of diseases, especially infectious diseases, in which the number of cases suddenly becomes far greater than usual, Usually epidemics are outbreaks of diseases in specific regions, whereas worldwide epidemics are called pandemics. Eating contaminated meat or having contact with the feces of an infected cat can put a person at risk for toxoplasmosis (tox-o-plaz-MO-sis). This zoonosis is caused by a parasite and can produce such symptoms as swollen lymph nodes, muscle aches, headaches, and sore throat in a healthy person and life-threatening brain infections in people with weakened immune systems, especially those who have HIV/AIDS * . If a pregnant woman becomes infected with the parasite, she can transmit the infection to her unborn baby, which can lead to a number of health problems in the child. If people eat meat (especially pork products, such as sausage or ham) infected with the eggs of Trichinella (trih-kih-NEH-luh) worms, they can contract trichinosis (trih-kih-NO-sis), a disease that produces such symptoms as diarrhea, vomiting, and abdominal pain. Trichinosis can cause nerve and muscle damage as well as heart and lung problems. It can be treated with medication. The treatment of a zoonotic infection depends on the specific disease, but many are treatable with prescription medications, such as antibiotics. * AIDS , or acquired immunodeficiency (ih-myoo-no-dih-FIH-shen-see) syndrome, is an infection that severely weakens the immune system; it is caused by the human immunodeficiency virus (HIV). U.S. Centers for Disease Control and Prevention (CDC), 1600 Clifton Road, Atlanta, GA 30333. The CDC tracks various zoonoses, the areas where they occur, and how many people are infected at any given time. It offers information on specific zoonoses at its website. KidsHealth.org . KidsHealth is a website created by the medical experts of the Nemours Foundation and is devoted to issues of children's health. It contains articles on a variety of health topics, including cat scratch disease, Lyme disease, psittacosis, rabies, and other zoonoses.